An employee at the Royal Tyrrell Museum in the Drumheller Valley in Alberta is always doing research in the lab. Without the daily research at the lab of the Royal Tyrrell Museum in the Drumheller Valley in Alberta, Canada half of the knowledge that we know today would still be hidden away. The scientists that work at this museum discover fascinating things about prehistoric days every day. A Labworker for the Royal Tyrrell Museum of Palaeontology in Drumheller Valley, Alberta, Canada. 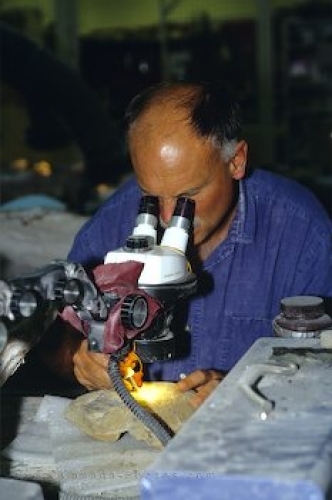 Picture of a scientist doing research in the lab at Royal Tyrrell Museum in Alberta.